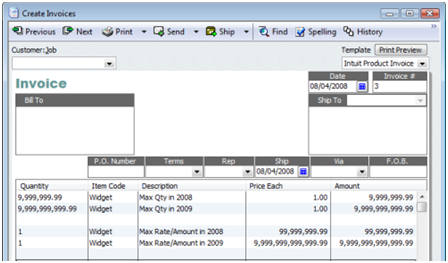 Intuit has started shipping QuickBooks 2009 today, and there are many new features. Today I’ll briefly describe some of the features that I feel are very important. An in-depth treatment of some of these features will be coming soon. There are quite a few additional items beyond what I list here. If there are features you’ve heard about and you want me to review them, please leave a comment below or send me an email and I’ll add that to my list to review. One of the changes that you may notice is that they are starting to change the “branding” of the product from just “QuickBooks” to “Intuit QuickBooks”, with an increasing emphasis on the “Intuit” name. QuickBooks finally recognizes that we have a world economy! For years the only way that you could enter transactions in different currencies in QuickBooks was to buy the Canadian edition, which didn’t work very well for most US based businesses. With this release we finally get multi-currency support in the US editions. If you work with foreign currencies this could save you a lot of heartache. HOWEVER, note that working with multiple currencies and your bank can be quite a complicated proposition. You will need to talk to your CPA about how to handle a number of issues. Unfortunately, they haven’t opened up all of the limits. You still can’t have a unit of measure conversion that exceeds a 1:5000 ratio. Performance: We should see fewer (they say “none”) of the dreaded “Server Busy” messages that you sometimes get in multi-user situations. I can’t testify to that, as I couldn’t give this a good multi user “stress test”. Read Locks: This is a big one, although I don’t know how far they have carried this through. I’ll give an example. Before this, if you wanted to use the Adjust Quantity/Value on Hand window you had to change to single user mode. VERY annoying. With this update you can do these adjustments in multi-user mode, which is far more convenient. There are still some restrictions, but they are very reasonable. Multi-User Backup: You can perform a QuickBooks Backup without having to kick out all of the other users! I’m still investigating this one – it doesn’t handle all of the complaints that I’ve seen – but it will be a great improvement. 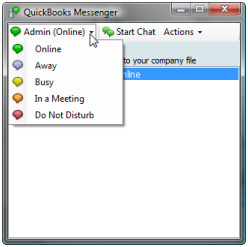 QuickBooks Messenger: Have you ever had to run around the building trying to find everyone who was using QuickBooks to tell them to get out so you could do something that required single user mode? Now we have QuickBooks Messenger, a way for users to see who is logged on, and to send them messages! In the next few weeks I’m going to review some of these features (multiple currencies and multi-user enhancements, at the least) in more detail. If there is a particular feature that you would like me to expand upon, leave a comment below. One of the big questions that always comes up – “should I upgrade to this version”? If you purchased your copy of QuickBooks in the last 30 or so days then you should call them and ask about getting a free update. If you are on a service contract with them you probably will already get a free update. A better question should be “should I install this new version”? That is always a hard decision. If you have a compelling need for any of these new features then you definitely should, BUT keep your old version installed and make backups before you update your company file, just in case. If you don’t urgently need the new features, I usually recommend waiting a bit of time until the first round of revisions come out. Bit updates like this one tend to have a few problems that aren’t apparent until many thousands of users have installed them on all of the various kinds of computer systems that are out there. Intuit does a very good job of running field tests before they release these versions, but it is hard to catch all of the problems right away. If you install the new versions, leave a comment as to what you think about it! can one now use MPN on sales order forms? No, Tom, they didn’t make that change. I haven’t come across any changes in the form designer so far. You should be able to use my CCRQInvoice program to add that column, as it uses a different form designer. Do you know if you can “combine” names in multi-user mode? For example, we receive customer names in from a third party software for internet sales. When the customer is a previous customer, we cannot change the imported name to the name that we actually use in our system (it comes in First Last ZipCode, and we save as Last First Initial ZipCode). We end up saving with numbers after the zip code so we can go back later in multi user mode and combine the names. This, of course, is very tedious and doesn’t get accomplished as often as it should! Unfortunately, that is NOT one of the changes they made. You still have to go to single user mode to merge list items. I can understand why – you potentially have a lot of transactions to change over and if someone else is working on any of them, the record couldn’t be updated. So by forcing single user mode you are sure that the conversion can take place. That doesn’t help in your situation, though. 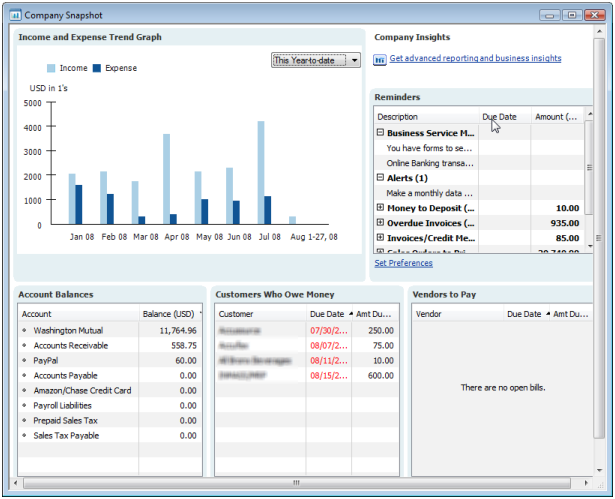 Does 2009 allow you to print a report similar to the company snapshot screen? Kristen, do you mean something that has ALL of that information in one report? Not that I’m aware of, although it is possible that I just haven’t found it. You can get most of the different portions of that screen from various reports. For example, the income/expense graph is found in the Report Center as the “Income & Expense Graph” under “Company and Financial” – at least, a very similar graph. For those who use PayPal extensively, do you know if 2009 offers any better integration? Thank you for your informative postings. I have read all of your work regarding the manufacturing edition in regards to assemblies and the limitations in reporting that results from taking this approach. Has 2009 worked out any of those bugs? QuickBooks 2009 is pretty much the same as 2008 in this regard. They do let you make copies of items, with the BOM for an inventory assembly, but that is a minor issue. Would like advise from people who have updated from QB pro 2006 through pro 2009. I first started using QB Pro 2006 (in 2006) for my small home business. Loved it. i did not require alot. Infact the program offers much more than i ever used. However, things change and now my husband is opening a new company. (service based). Anyway, at first we wont require to many special features (still), wont be using online banking, no employees. I am reading mixed info about QB 2009 actually taking away some of its previous features like the help forum, is it true you cant access the HELP menu unless your online w/ 2009? I am also hearing tha 2006 pro was better than 2008 & 2007 and quite possibly even 2009. I just dont want to fork out the $$$ for an upgrade thats a “down” grade. then again i am concerned that pro 2006 is three years old. can anyone give me exprience related info who might have used both? Want the 2009 but afraid of not liking it as well? Tracie, perhaps a better place to ask this is in the Intuit community forum. You’ll get a lot more visibility to your question there. My basic answer to this very common question is split into two parts. First, if you like what you have, if you are sticking with Windows XP, and you aren’t using any of the services that will be discontinued (online banking, emailing of reports/invoices, payroll and so forth), consider sticking with what you have. If you need to move to Vista, need to use a service (emailing of invoices is the common one), are want to take advantage of any of the improved/added features of later versions (there are some good ones, but not every business needs them) then upgrade to QB 2009. As for 2009 and being off line – you can still access the Help file just as before, you just can’t use the new “Live Community” feature if yu aren’t online. However, you can always log in to the Intuit Community forum directly. No problems here. Some people run into some issues with firewalls, but they are usually fixable. I personally don’t consider it to be a downgrade at all, other than for online banking. Just my opinion, others might not agree. I’d like to get advice on updating my Quickbooks Premier 2006. I’m currently using QB Premier 2006 and would like to downgrade to Quickbooks Pro 2009. I would like to know if this is possible and if so, will my exsisting information be transferred over safely? Please advise. Thank you for your help! Aloha! Kanoa: Pro can read a Premier file – the only problem is if you try to access a Premier feature in the file with Pro. For example – sales orders are not supported by Pro, so if you have sales orders in your Premier file you won’t be able to access them with Pro. I have a question in relation to multiple currencies in the QB Premier 2009 edition, that you briefly touch on above. We are a manufacturing operation based in Indonesia, and all goods produced here are exported to the US to our parent company which sells our goods to US and EU markets. Our parent company sends us operational funds each month for production, and also supplies us with some items which are purchased in the US using US dollars, as well as paying for some items produced in Indonesia in the US using US dollars. My problem is, we need to produce accurate pricing information for the US based on the US dollars expended for all finished goods (jewelry), but how do we do this for materials (items) purchased in the US, as well as items produced here, but paid for in the US by our parent company? At present, our BOM is set up in local currency, as most of our expenses are in Rupiah. Thanks for your help. Alex, unfortunately that is not a simple question, and I don’t have an answer that I can give to you in a short comment. There are discussions and help available through the Intuit Community forum, I suggest that you try that. The multiple currency feature works best when considering sales and accounts receivable – when you get to costs the program becomes more of a chore to use. 1. am unable to see any customer payments. to spread it among customers. This means, I would have to define my vendors as customers also. not reasonable. I don’t think R10 can be removed either…. Charles, this blog isn’t really set up to handle general tech support kinds of question/answer, the Intuit Community Forum is a better place to discuss that. For #1, where are you looking? For #2 – you enter credit card charges in the “enter credit card charges” option in the “banking” menu, and on the “purchased from” line you select a specific vendor. Enter one charge per transaction. The “customer” option in the detail section is to be used if these are billable charges to a customer. You don’t enter a whole credit card payment covering multiple vendors all in one transaction.